Last year the Heidenheim Opera Festival (Opernfestpiele Heidenheim) started a project to perform Verdi's early operas in chronological order. So having performed and recorded Oberto last year (see my CD review), it was the turn of Un giorno di regno this year. Directed by Barbora Horvakova Joly with designs by Eva-Maria van Acker, the production featured Gocha Abuladze, Davide Fersini, Michaela Maria Mayer, Elisabeth Jansson, Giuseppe Talamo, David Steffens, Leon de la Guardia and Daniel Dropulja. Marcus Bosch (artistic director of the festival) conducted the Cappella Aquileia, the festival's own orchestra, and the Czech Philharmonic Choir Brno. The success of Verdi's first opera, Oberto led to a three-opera contract with la Scala, Milan. The first opera was to be a comedy, on a libretto by Felice Romani, Un giorno di regno, which premiered in 1840. For the commission Verdi was required to choose an existing libretto, the one he selected dated from 1818 and Verdi simply regarded it as the least bad. The period 1838-1840 was a bad one for Verdi, his wife and children died and Un giorno di regno failed to please (though it did reasonably at subsequent revivals). He threatened to give up composition but the impresario persuaded him and the result was Nabucco. The rest, as they say, is history; but Verdi wrote no more comedy until his last opera Falstaff (1893), and nursed a long-standing grudge against the audience at La Scala. So what of Un giorno di regno? Though based on the historical figure of Stanislas Leszczynski, the plot is a standard 'black box'' sequence of false identities and foiled love affairs. 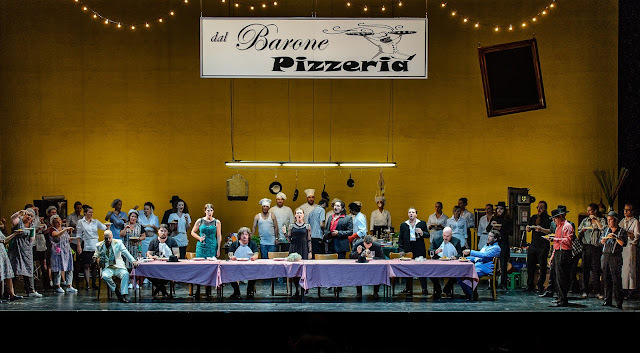 If one draws a line from Oberto, through Nabucco and onwards through Verdi's earl operas charting the influence of Donizetti, then the fascinating thing is that Un giorno di regno does not fit. For his first comedy Verdi seems to have looked to the example of Rossini; perhaps it was the old-fashioned libretto, after all the opera contains Verdi's only use of secco recitative.Though the delineaments of Verdi's style are visible, the main adjective to describe the opera's music, with its preponderance of ensembles, is Rossinian. Performing the opera in a relatively small theatre, the Congress Centre Theatre in Heidenheim which seats around 950, with a chamber sized orchestra (Cappella Aquileia fielded eight first violins) emphasised these links as Marcus Bosch drew playing of great litheness, lightness and liveliness from his players. The vocal writing has a Rossinian sense of elaboration about it, and one suspects that one reason for the opera's relative neglect has been the challenge of casting the piece. Heidenheim had put together an excellent young team. The young director Barbora Horakova Joly has worked with Calixto Bietio and David Bösch, and in June 20017 won the City of Graz prize at the Ring Award (the international competition for stage direction & design) at the Graz Festival. The plot of the opera is such that it could almost be set anywhere. Horakova Joly chose a 1970s pizzeria with Belfiore (Gocha Abuladze) impersonating not Stanislas Leszczynski,but a Mafia boss nicknamed the 'King of Poland'. 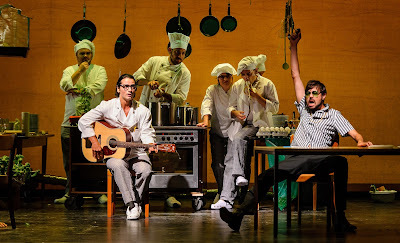 His host, Kelbar (Davide Fersini) thus became the pizzeria proprietor with his daughter Giulietta (Michael Maria Mayer) destined to marry his associate La Rocca (David Steffens) but she is in love with Edoardo (Giuseppe Talamo) from a rival restaurant. The extra complication is Marchesa del Poggio (Elisabeth Jansson) who recognises Belfiore and is in love with him. As the 'King of Poland' he pretends not to recognise her so she makes mad passionate love to Ivrea (Leon de la Guardia). This latter role is quite small, but Horvakova Joly expanded it by allowing Leon de la Guardia to improvise on the guitar (especially when serenading Marchesa del Poggio). 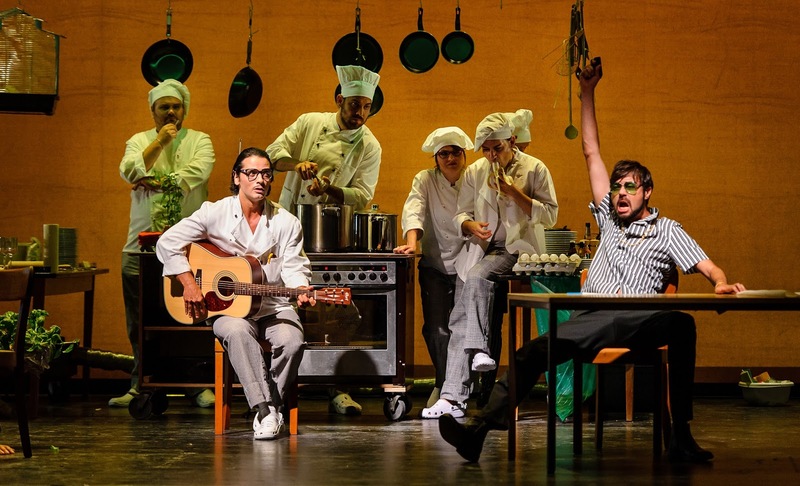 As the pizzeria chef, Leon de la Guardia was the centre-piece of the production's striking feature, De la Guaria was cooking on stage when we entered (you could tell from the smells emanating from the stage) and the whole of Act One was based around the rhythms of restaurant, with De la Guardia serving a meal to the ensemble at the end of Act One! 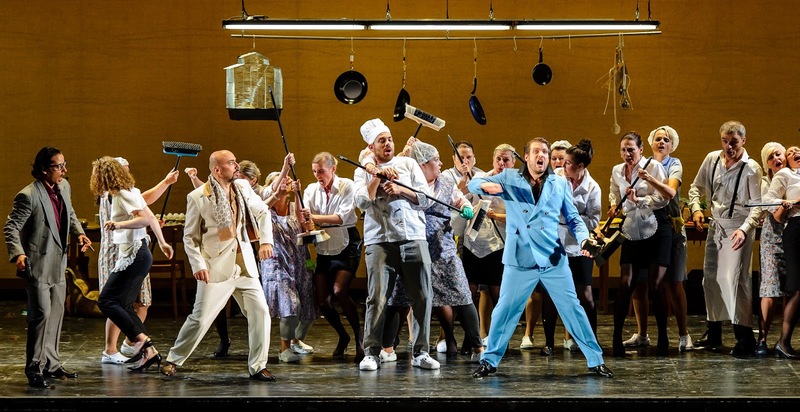 Not a bad idea, but with a large cast and chorus, most of whom had a particular character to play, Horakova Joly's production ran the risk of being over busy. Granted, you always know where to focus attention but there where many moments when subsidiary action threatened to pull focus. The sense of purposely vivid over-acting, especially from the chorus, also threatened to overbalance things and you longed for some moments of calm. In Act Two, things calmed down somewhat, and Horakova Joly seemed to learn to trust the music more. That said, the production was extremely funny and she managed to make the long ensembles work without having to resort to too much slapstick or Ministry of Silly Walks. 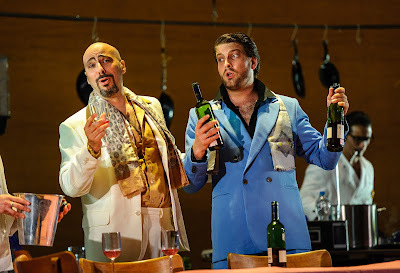 Gocha Abuladze certainly looked the part of a would-be Mafia boss but he has the Rossini's Figaro in his repertoire and sang Belfiore with admirable fluency, a lovely dark tone and not a little wit. David Fersini was a delight as Kelbar, the proprietor of the pizzeria who finds his plans foiled, with stylish musical contributions. Michaela Maria Mayer made a Giulietta of real charm, the heroine for whom Belfiore is a deus ex machina. Mayer even demonstrated a neat facility in yoga as well. She aptly conveyed Giulietta's fragility, though there were times when the role's technical demands pushed her to her limit. Elisabeth Jansson made a stylish yet very funny Marchesa del Poggio, well able to combine her cabaletta with an athletic dance with Leon de la Guardia's Ivea. Jansson proved adept at combining her rich tone with Verdi's passagework in a most appealing way. Giuseppe Talamo was the rather drippy Edoardo, beloved of Giulietta but requiring outside help to gain her. 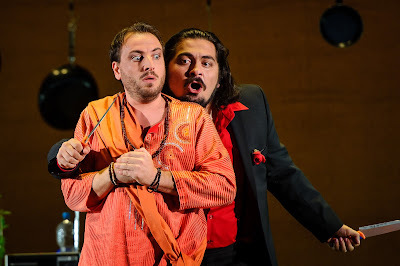 Talamo has a classic lyric tenor voice (Rodolfo, Alfredo, Duke of Mantua) and the tessitura of the role seemed to lie high for him (the first Edoardo sang Rossini's Otello and Arnold in Guillaume Tell), but Talamo gave us plenty of open tone and Italianate style. David Steffens had the problem of making La Rocca (Giulietta's father's choice for her husband) seem undesirable as love-interest. As a youthful lyric baritone he was hardly too old (as La Rocca is supposed to be) so Steffens turned him into a bit of an annoying idiot. No matter, Steffens singing was always entirely musica. Leon de la Guardia played his relatively small role of Ivea to the hilt, looking and sounding the part and relishing the opportunity to ad lib. There was strong support from Daniel Dropulja as Delmonte. The Czech Philharmonic Choir of Brno entered into Horvakova Joly's concept with a will, creating an array of strong characters, perhaps too much so; on the theatre's tiny stage there were moments when it felt like the stage was full of people clamouring for attention. But as ever, the choir's singing was superb and they provided fine sympathetic support in the ensembles. After a lithe and lively account of the overture, Marcus Bosch and Cappella Aquileia drew us into Verdi's work, never trying to make the piece something it wasn't. Rossinian links were there, but also hints of the Verdi to come. The performance was being recorded for issue as a CD on Corviello Classics later this year. Next year the opera festival's exploration of early Verdi reaches Nabucco and I Lombardi all prima Crociata.